Held on the first Friday of each month from 5-11 p.m., the First Friday Trolley Hop is a tour of all of the galleries in Downtown Louisville’s art district. The event takes participants to several different art galleries located on the Main, Market, and Fourth Street strips. Best of all, there’s no charge to ride the trolley and no entrance fee at any of the participating galleries. 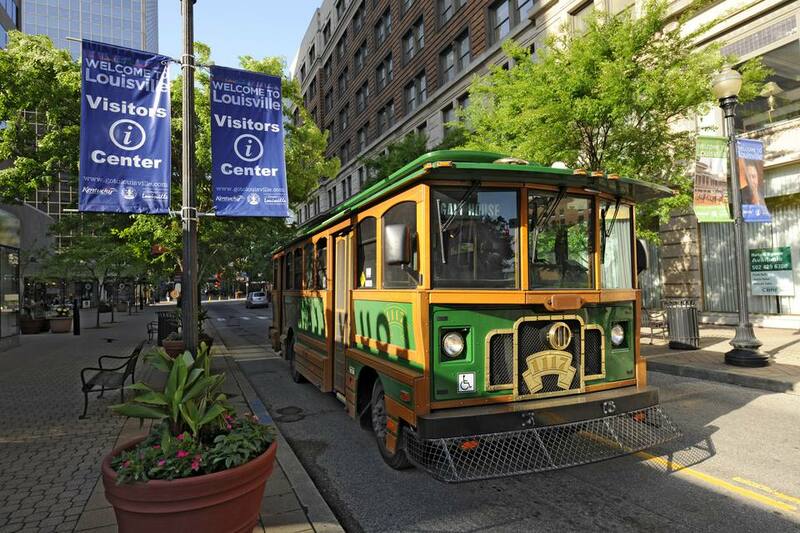 How Does the First Friday Trolley Hop Work? Louisville’s historic trolleys circle the art district from 5 p.m. to 11 p.m., dropping off and picking up passengers at the different Trolley Hop stops every 15 minutes. The event has no official starting time or place, so you can show up at whatever time you’d like and jump on a trolley at any of the trolley stops. If you’re unsure of where to park, the Trolley Hop website offers a full map of each of the trolley stops. Actors Theatre Gallery - Throughout the hallways at Actors Theatre is its art gallery, a display of a diverse array of artwork created by both local and regional artists. The Gallery at Kentucky Center for the Arts - In the main lobby of the Kentucky Center for the Arts is a small art gallery that showcases the works of both individual artists as well as group exhibits. Pyro Gallery - Features painting, photography, and sculpture as well as non-traditional forms of art created by member and featured artists. 21c Museum Hotel - The Proof Gallery housed within the 21c Museum Hotel is a 9000 sq. ft. art museum that is funded and operated by the International Contemporary Art Foundation. Kentucky Museum of Art and Craft - The Kentucky Museum of Art and Craft was formed to support the extensive art and craft history of Kentucky through the exhibition of unique art made by residents of the state. The Green Building Gallery - The Green Building Gallery features displays by both local and regional artists in mediums such as painting, sculpture, and new media. Glassworks - Glassworks is one of Louisville's most well-known art galleries for its two galleries of glass sculptures as well as its frequent glass-blowing classes and workshops. Zephyr Gallery - Zephyr Gallery is the oldest co-op gallery in Louisville featuring local artists works in contemporary painting, sculpture, and photography, among other mediums. To avoid the out-of-towners, it’s best to get on the trolley at one of the stops that are closer to the Highlands. The stops closer to Glassworks will have the largest crowds at the beginning of the night. Many of the galleries on the Trolley Hop have restaurants where you could grab dinner or a sandwich. However, many of the galleries without restaurants will offer drinks and snacks to their visitors, and it’s possible to fill up on the free food without overspending at a gallery restaurant or café.